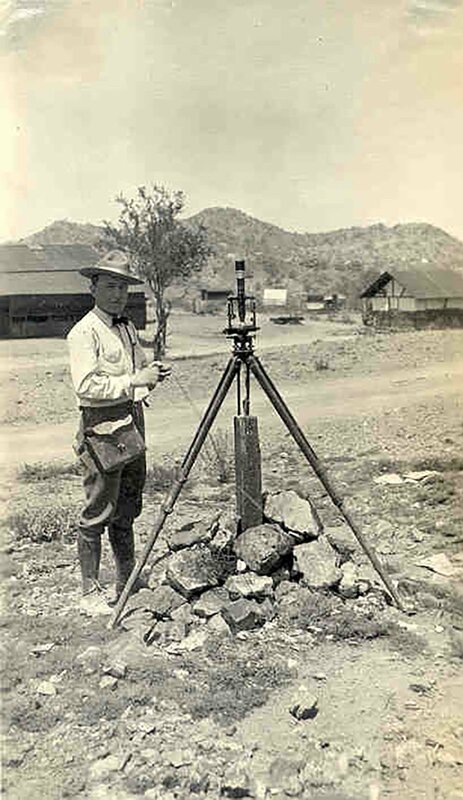 A surveying scene during the early 1900s around mines near Ajo. Moskold’s engineers’ theodolite, at the Chicago Exhibition in 1893. Quadcopters, low-cost consumer drones, are used at mines throughout the world. A Davis’s Miners Dial comprised of a six inch diameter compass-box and sights used extensively in coal mines. 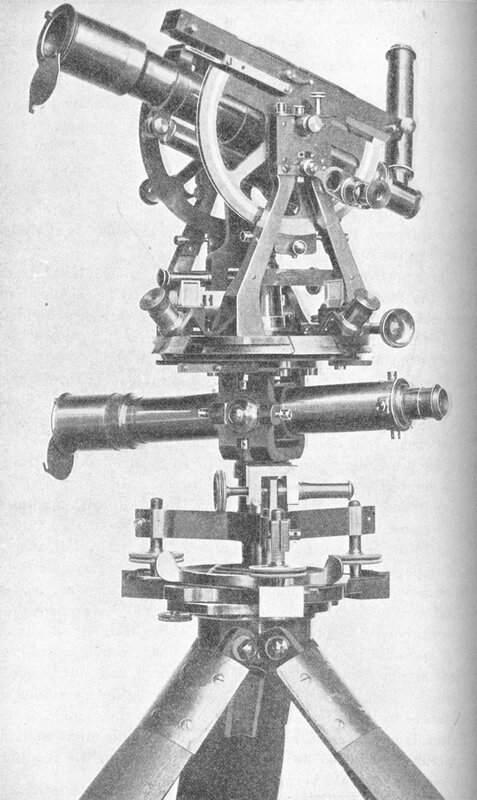 A Bridges Lee Photo-Theodolite specifically designed for accurate photographic surveying. An illustration from Agricola pertaining to a cord survey. Mine surveying has a long history of having an integral role in the development of mining operations. Its application is essential prior to the breaking of ground and the commencement of mining operations. A successful survey will show the extent of mineralization in a particular area, land contour, drainage, direction of faulting, mine boundary lines, effective transportation routes both above and below the surface for mine haulage and ventilation. A mine surveyor’s responsibility is to measure the development of mine workings along with plotting extensions on a map while determining the limits of underground stoping. One of the oldest maps in the world consists of the mapping of a mining region around 3,000 years ago. Housed in the Egyptological Museum at Turin, Italy, the Turin papyrus depicts gold mines located between the Nile River and the Red Sea. Early mining surveys were recorded by Hero of Alexandria wherein he discussed the method of surveys used in Greek mines, a rectangular sighting instrument he invented and christened a diopter. It was used for rough leveling purposes and as an early angle-measuring instrument. From antiquity through the Middle Ages, the divining rod (fashioned out of a Y-shaped or two L-shaped twigs or rods) was commonly used as a means to seek out groundwater and metals. However, this instrument has always been controversial, as its accuracy has never been proven through controlled scientific tests. The science of surveying was held in high regard by Georgius Agricola, known as “the father of mineralogy,” when he emphasized its necessity in determining how deep a shaft should be sunk in conjunction with subsequent tunneling. He also showed its importance in setting the parameters of a mine’s workings so they don’t encroach on other mining properties. Agricola’s writings deviated from the current practice of his time of seeking metals and water with a divining rod. He supported the concept that lodes were created as mineral deposits were formed by the permeation of surface waters combined with heating at the subsurface level and mixed with the mineralization from adjacent rock. In his book “De Re Metallica,” published in 1556, he includes an early illustration of surveying in which a miner is measuring the distance to connect shaft and tunnel. More extensive measures evolved as survey methodology improved in terms of reading angles, measuring distances, computing azimuths, and recording bearings, latitudes and departures, coordinates, and elevations on and below the surface. After the 16th century, transits and theodolites, a precision instrument, were used for accurate measurement of horizontal and vertical angles. Theodolites (invented by Leonard Digges, an English mathematician) were preferred for accuracy, precision and light weight. A theodolite was carried by the famous Lewis and Clark Expedition. Geophysical prospecting in the early 20th century continued to improve with the advent of the dripping needle, used to detect magnetic iron ore bodies by their magnetic reaction. A later upgrade was the Hotchkiss Superdip magnetometer, with enhanced sensitivity controls to detect anomalies and better determine vertical magnetic intensity. These surveys have been helpful in determining placer deposits characterized by concentrations of black sand (magnetite). Despite its limitations in underground mining due to the magnetic obstruction of steel rails, pipes, cable and electrical lighting, the compass was used to read angles. As technology continues to advance, aerial drones, or Unmanned Aerial Vehicles used in military operations, are becoming more commonplace at mines to collect data on the topographic features of surface mining, including bench positions of open-pit mines along with underground mining operations. Made from plastic or carbon fiber, these remote-controlled aerial vehicles are light weight (2-11 pounds) and small size (4 feet), carrying an average of 7 to 10 pounds of payload. Benefits outweigh those of conventional mapping, including the ability to apply high-resolution mapping to an area in just a few hours. It is less costly to use drones for this work. They also have the ability to operate in inaccessible or remote areas. Imagery produced by drones and processed by computers has been successful at differentiating ore bodies, each having unique electromagnetic spectral signatures. The ability to do aerial magnetometer surveys ensures a well-rounded identification of the surface geology including terrain and daily production figures at a mine site. No doubt the use of drones in mine surveying will continue to streamline and dominate the collection and processing of data in mining operations around the world, including open-pit mapping and geological modeling in open-cut mines. Agricola, Georgius. De Re Metallica, Translated by Herbert Clark Hoover and Lou Henry Hoover. New York: Dover Publications, Inc.1950. Brough, Bennett Hooper, A Treatise on Mine-Surveying. London: Charles Griffin and Co. 1888. The Evolution of Mine-Surveying Instruments. Discussion of the Paper of Dunbar D. Scott, presented at the Buffalo Meeting October, 1898. Taken from (New York Meeting, February, 1899.) from Transactions. American Institute of Mining Engineers Vol. 29 1899. Lupton, Arnold. A practical treatise on Mine Surveying. New York: Longmans, Green, and Co. 1902. McMahon, David M. “The Turin Papyrus Map, The Oldest Known Map With Geological Significance.” Earth Sciences History, vol. 11, no. 1, 1992, pp. 9-12. For thousands of years, miners have confronted the challenges of creating adequate ventilation and air conditioning necessary to keep miners safe.